Artemis Racing’s shore team has been working around the clock to get the team’s AC45 ready to race in San Diego following on from a severe collision with GreenComm on the final day of racing at the America’s Cup World Series – Plymouth. Having had to replace the starboard hull, as well as make repairs to the port hull and the wing, the team has been flat out since arriving in San Diego two weeks ago, just in time to begin training on Wednesday. Having hosted the America’s Cup from 1988-1995, San Diego is part of the America’s Cup history, but the ACWS – San Diego marks the beginning of a new era. This being the first event of the 34th America’s Cup to take place in the US and with Terry Hutchinson as the only American Skipper competing in the event. To add to the excitement, this evening National City hosted a special welcome celebration and barbeque for the Swedish team whom they have adopted for the event. 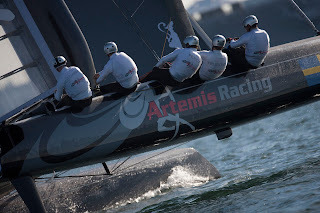 The Artemis Racing crew for the America’s Cup World Series – San Diego includes: Terry Hutchinson (USA) – Skipper, Iain Percy (GBR) – Tactician, Rodney Ardern (NZL) – Wing trim, Morgan Trubovich (NZL) – Trim, Julien Cressant (FRA) – Bow, with Sean Clarkson and Stu Bettany as reserve sailors. “We’re rotating as many people as possible through the program which is great. If there’s one thing that the AC45 is good for, it’s that. It does expose our sailing team to high-paced, high-action sailing. The courses and the type of racing that we’re doing is a micro of what we’ll be doing on the AC72. You definitely get an appreciation for how quick and fast everything happens,” said Skipper Terry Hutchinson. Artemis Racing looking forward to lining up against the eight other teams when racing which beings at 1300 PST on Saturday, with six fleet races scheduled for this weekend. Racing then continues on Wednesday, 16 November with five full days of fleet and match racing. The AC45s will be back out practicing tomorrow on Veteran’s Day with the USS Midway presiding over the race course.